The Movement of the Taliban in Pakistan has named Mullah Fazlullah, the radical cleric from Swat in northwestern Pakistan, to lead the group following the death of its former emir last week in a US drone strike. “Fazlullah is the new TTP [Movement of the Taliban in Pakistan] chief,” Asmatullah Shaheen Bhittani, the head of the group’s executive council who was appointed interim emir after Hakeemullah’s death, told reporters “at a press conference at an undisclosed location in northwest Pakistan,” Dawn reported. 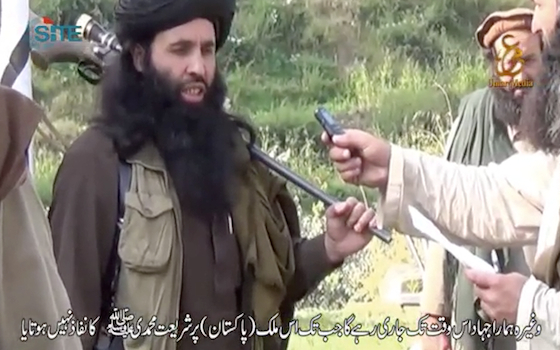 Asmatullah also told AFP that a commander known as Sheikh Khalid Haqqani was appointed as Fazlullah’s deputy. Shahidullah Shahid, an official spokesman for the Movement of the Taliban in Pakistan, also confirmed to Reuters that Fazlullah is the new emir of the Movement of the Taliban in Pakistan. Fazlullah was one of four top Taliban commanders thought to be in the running to replace Hakeemullah, who was killed in a US drone strike on Nov. 1 in the Miramshah area of North Waziristan. Khan Said, who is also known as Sajna Mehsud and who served as the group’s deputy emir under Hakeemullah, was rumored to have been appointed to lead the Movement of the Taliban in Pakistan immediately after Hakeemullah’s death. But the Pakistani Taliban did not officially confirm the report. Sajna was thought to be the frontrunner to replace Hakeemullah, as he has served as the deputy emir and is based in South Waziristan, a hub of the group’s power in the tribal areas. Both Hakeemullah and Baitullah Mehsud, his predecessor and the founder of the Movement of the Taliban in Pakistan, were from South Waziristan. Fazlullah, who is also known as Mullah Radio for his radical sermons broadcast throughout the northwest, has been among the top leaders of the Movement of the Taliban in Pakistan since its founding in 2007. He engineered the Taliban takeover of Swat and neighboring districts from 2007-2009, and brutally ruled over a cowed civilian population. The Pakistani military intervened only after Fazlullah forces invaded Buner and advanced to just 60 miles from the Pakistani capital of Islamabad. He has vowed to continue the fight to regain control of the Swat Valley. He is one of the most extreme commanders in a group filled with extremists. He was one of the first leaders to have opposed polio vaccinations. Last year, he proudly ordered the assassination of Malala Yousufzai, the young schoolgirl who passionately spoke out against the Taliban in Swat, and accused her of violating sharia, or Islamic law. This year, he took credit for the assassination of a Pakistani Army general who commanded operations in Swat. Fazlullah is also closely tied to al Qaeda. When he openly ruled Swat from 2007 to 2009, he said al Qaeda fighters were welcome there and that training camps were in operation. One of his top deputies, Ibn Amin, also served as a leader of one of six known brigades in al Qaeda’s Lashkar-al-Zil, or Shadow Army. Amin was killed in a US drone strike in Khyber in December 2010. The new Taliban emir is known to take shelter in Afghanistan’s remote northeastern province of Kunar. US forces largely withdrew from Kunar and neighboring Nuristan provinces beginning in 2009 after remote Army outposts came under deadly attacks. US military officials claimed the insurgency would recede from the two provinces and that al Qaeda would lose support as US forces were fueling the insurgency. Instead, al Qaeda and groups such as the Lashkar-e-Taiba and the Movement of the Taliban in Pakistan have become entrenched in the two provinces since the US withdrawal.